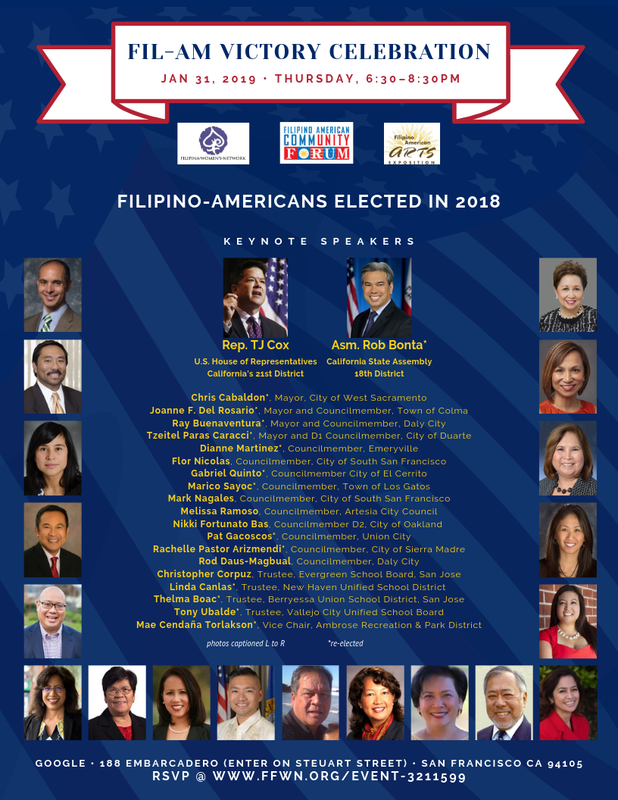 The Filipino American Community Forum with the Filipina Women’s Network (FWN) and the Filipino American Arts Exposition (FAAE) are once again hosting a victory celebration for recently elected Filipino-Americans. “SAN FRANCISCO – Leaders here are kickstarting the new year with impassioned resolve to unify and mobilize the community with a definite focus on the next two years. First California Fil-Am US Rep. TJ Cox will keynote the Victory Celebration, barring an emergency vote on the government shutdown. Constant collaborators Marily Mondejar and Al Perez are joining forces anew to celebrate and build on the victories of Filipino American political candidates in the recent midterm elections at a grand meeting of the Fil-Am Community Forum 6-8 p.m., Thursday, Jan. 31, at the Google Community Space at 188 Embarcadero,San Francisco. The event is free and open to all who confirm attendance no later than Jan. 25. Newly sworn-in United States Rep. Terrance John “TJ” Cox (D-21st District), the first Fil-Am from California elected to the US Congress, has confirmed to keynote the event, unless he is required to remain in the Capitol should an emergency vote be called on the current government shutdown.